I heard this morning that Elizabeth Edwards has had a recurrence of cancer. Meeting her last fall with the Silicon Valley Moms Blog women was one of the highlights of my year. She is a warm, delightful person, full of life and energy. This morning, she said that she and Joh are optimistic because, "it's who we are as people." I'd like to think that that is the spirit of their campaign as well and that all of us remain optimistic, no matter how bad things have gotten. It's who we are as people. I have three friends who have been diagnosed with breast cancer in the last five years. All of them are moms like me, in their '40's, and all have come through painful treatments and fought their way back to health. One of them has had a recurrence, and is hopeful that she can beat it again. When I saw Elizabeth this morning on TV, I was reminded of my friend and how I should find out how she is doing, to remind her to stay strong and optimistic. Today, I am thinking of Elizabeth and and my friends who are fighting this disease. I'm sending her my love, hope, and prayers. I'm staying optimistic for her, and hope that some day our paths will cross again so I can tell her. Thanks to everyone here and here for the suggestions on "Where in the World Should Frank Go Next?" The suggestions were fun, but included a few places we've been and would love to go back to, like the Seychelles, and a few places we hadn't thought of in the past. We eventually we settled on a family trip to Greenland in July and will be celebrating Frank's 100th country there. Greenland was actually suggested by Mary R., a reader who e-mailed me. We'll be sending Mary a small prize from Greenland when we return. I'm not sure what Greenland has to offer in terms of prizes, but I'll come up with something. So, why Greenland? From the photos I've seen, it looks something like two places we've been before: Barrow, Alaska and Churchill, Canada. 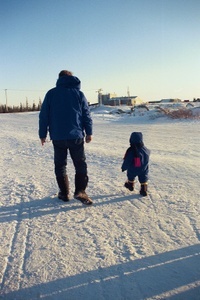 Both were memorable trip, and we got to experience 24-hour daylight in Barrow and the polar bear migration in Churchill. The thing that tipped the balance in favor of Greenland was that there are now direct flights via Air Greenland from Baltimore, so we don't have to fly to Europe in order to get there. Also, a number of news stories last year showed the glaciers melting at an alarming rate, so who knows what it will look like if we wait? Most of the glaciers are only visible by helicopter and ferry boat, so we'll be taking along some extra Dramamine on the trip. Ilulissat Icefjord is a UNESCO World Heritage Site, and I can't resist seeing those. Thanks for the suggestions! Maybe next year we'll make it to Iceland, the Maldives or another great place that you recommended. If you'd like a postcard from Greenland, e-mail me your address and I'll drop you a line. 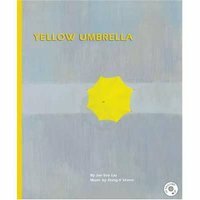 I was approached by someone at Kane Miller Books to review some of their children's books, and one of the selections I received was Yellow Umbrella by Jae Soo Liu and Dong Il Sheen. This book previously won the New York Times Best Illustrated Book Award for it's beautiful watercolor illustrations. Kane Miller is a publisher that specializes in translations of foreign-language children's books into English. Yellow Umbrella is not so much a storybook as a picturebook accompanied by music. Included in the back of the book is a CD that you play along with the story. We have several books with a CD of the author or some actor reading the story, and I have to confess that we never listen to them. Since Alex is six, I'd rather read them myself or have him try to read them. In this case, the CD is integral to the book, since there are no words, and the music tells the story along with the pictures. I found this book to be enchanting and unexpectedly moving as I went through the pages. The pictures are beautiful renderings of a rainy day, shown from a bird's eye view of the top of an umbrella moving through a neighborhood, through city streets, through a park and onto the final destination. As the yellow umbrella moves, it is joined by other umbrellas of different colors, but you don't see who is beneath them until the very end. The music plays the part of the rain and lets you know when it is raining harder or softer as the umbrellas make their journey. It is simple piano music, and I was surprised at how much emotion and mood was set by the tune. I looked at this book with Alex, and I think he wanted more action or conflict in the "story" so we ended up making up our own story to go along with the pictures. We talked about where the people might be going, where they lived, and what they might do when they got to their destination. At the end of book, there is a song sung in Korean, with the words in English translated at the back of the book so you can read along. The singers are an adult male voice and a child. It's a very sweet song about an umbrella, and possibly an opportunity to learn a little Korean. I think this book would appeal to kids of all ages, from infants just learning to interact with books and music, to older kids who can use their own imaginations to create a story or paint a picture or a sing a song that they make up themselves. I think this book would delight infants and parents alike and would be a great alternative to the Baby Einstein videos. For toddlers and pre-schoolers, you can use the book to teach colors and counting. I was impressed by the high-quality, glossy pages of the book, and thought that it would be one that would stand the test of time--both in the timelessness of the story and presentation and in durability. We've had quite a few books get taste-tested, thrown around, and ripped to shreds, but I thought that this book was well-made and would be one I'd want Alex to pass along to his own kids someday. The value of reading with your child, at any age, is not so much what they learn from the story, but the intimate interaction between parent and child. It's the shared experience of words, pictures, and in this case, music, that draws you in together. Some of my favorite times with Alex have been snuggling on the couch reading stories together, or seeing him read with his dad and grandparents. I hope that those experiences will have a lasting impression on him and give him the lifetime gift of the joy of art, music, and reading.